There is a hierarchy to the Universe: Levels of structures, from the smallest of quantum particles to the most vast of cosmic scaffolding stretching across all of reality. Galaxies, themselves, lie somewhere in the middle. Huge collections of dark matter, dust, gas, and stars, galaxies are held together by their own gravity, and range in size from a few hundred light years to over a million light years in width. Over huge distances, they huddle together, forming everything from small clutches like our own two dozen component Local Group to enormous galaxy clusters of thousands of massive galaxies. The Coma Cluster lies about 350 million light years from Earth, and is a bustling collection of over two thousand galaxies. Two huge galaxies dominate the center of Coma: NGC 4889 and NGC 4874. Both are ridiculously huge, elliptical galaxies, each having an extended halo of stars around them that is over a million light years across. Compare that to our own Milky Way, which is 100,000 light years or so in size. 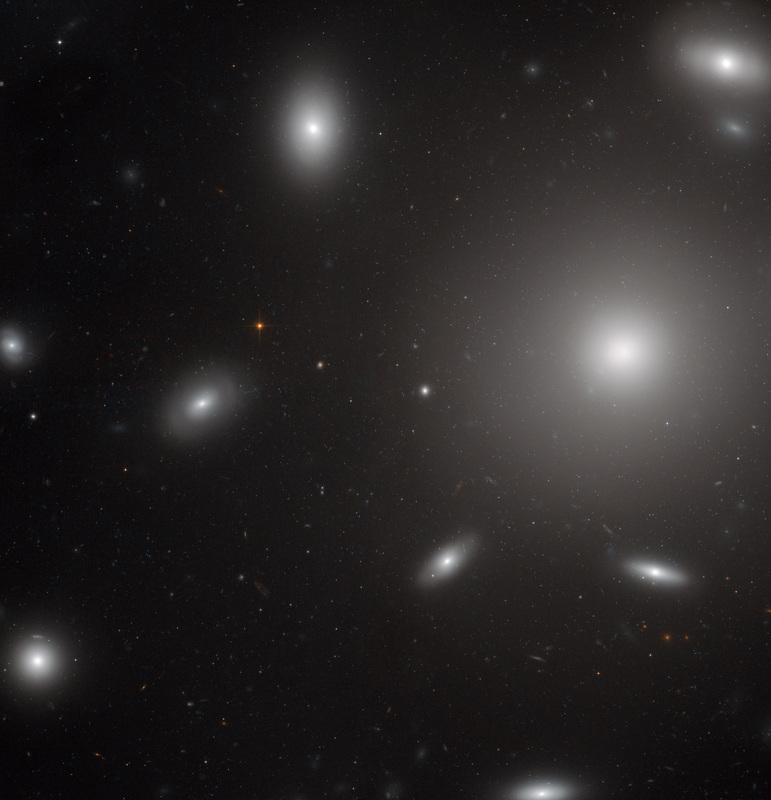 Observations of NGC 4874 using the Hubble Space Telescope reveal more of the universal hierarchy, too: Surrounding it is a cloud of something like 30,000 globular clusters! That’s staggering: The Milky Way, no small galaxy itself, only has about 150 known globulars. Globular clusters are roughly spherical collections of hundreds of thousands, or even millions, of stars, tightly compacted in a small volume of space and orbiting each other due to their mutual gravity. They’re one of my favorite objects to observe with my own telescope; they look like beehives, swarming with stars. They are fascinating objects: Most are extremely old; not much younger than the Universe, itself! They were among the very first objects to coalesce, and astronomers still argue over whether they merged and grew to form galaxies, or if galaxies, too, formed directly out of the material in the young cosmos. Some globulars show two distinct groups of stars, one older, one younger, indicating a second wave of star formation occurred in them; the reasons for this are as yet unknown. They’re simply stunning objects both visually and scientifically, and NGC 4874 has 200 times as many as we do. You can see them in the full-size image, dotting the volume of space around the galaxy. The sheer number of them is amazing. I was interested to learn that a few of those dots aren’t globulars, either: They’re ultra-compact dwarf galaxies. I’ve written about these before: They’re tiny (a couple of hundred light years across), extremely densely packed galaxies. They likely started off life as small, but complete, galaxies, and over billions of years, close encounters with other galaxies (and, in this case, likely NGC 4874, itself) have stripped them of their stars. This process tends to pull off lower mass stars and let heavier ones fall to the center, creating the dense remnant. When I first saw this image, two things struck me. One was how few actual stars there are in it (like the red one center left); almost everything in it is a galaxy or one of the NGC 4874 companions. We are inside the Milky Way, so, when we look in the sky we see stars. We have to look past them to see outside our galaxy to the cosmos beyond, like looking out a slightly dirty window to see the landscape around you. In many Hubble images, you see tons of stars. But when I saw this image, without even knowing what particular galaxies it was showing us, I knew something about where it was pointed: Up and out, away from the flat plane of the Milky Way. Since our galaxy is a flat disk, when you look into the disk you see zillions of stars. If you look out of the disk — think of it as “up” or “down” relative to the plane, what astronomers call “high galactic latitude” — there are fewer stars. The Coma Cluster is called this because it’s in the constellation of Coma Berenices, which is indeed toward the north galactic pole. It’s nice to see my astronomical intuition still works sometimes. The other thing I noticed was how ghostly the galaxies look. Instead of the usual detail of dust clouds, red and pink gas clouds, sweeping blue spiral arms, what we see here is a fuzzy, diffuse glow. Again, I knew immediately what this meant: This Hubble image was taken in the near infrared. Again, my intuition was spot on. This shot is a combination of blue light (shown as blue) and near-infrared light (just outside what our eyes can detect, shown as red). That’s why the galaxies look smooth! In that latter color, the gas clouds don’t emit much light, and you see the smooth distribution of older, redder stars in the galaxies. If you look closely at a few, you can still see some structure, though. But it’s not nearly as blaringly obvious as it is in other Hubble images of galaxies. What you see depends on how you look. That’s a good thing to remember. It may be hard to grasp at first, but as you gaze upon the multiply-layered hierarchy shown in this image — affected by subatomic particles like light and gas molecules, but also stars, clusters of stars, galaxies, and clusters of galaxies — remember that somewhere in that range is you, and just like all these magnificent objects, you’re a multi-layered structure in the Universe, as well.